The NCI 7829 shipping scales are available in a variety of sizes and capacities, to suit virtually every large parcel and container. Capacity 250 lb. Platform: 20" x 20"
The NCI 7829 shipping scales are available in a variety of sizes and capacities, to suit virtually every large parcel and container. Cap: 250 lb and platform is 20" x 20"
The NCI Model 7829 Bench Scale provides the most accurate and reliable weight measurement for static or inline shipping. The weighing solution for any application requiring a durable bench scale. NCI says the 7829 would be the direct replacement for the old NCI 3835, it has the same capacity and resolution size. The communication is the same, same length of serial sring output. The only difference is the 3835 factory default for baud rate was 1200, the 7800 series baud rate is 9600. All baud rates are programmable in the software and the end user should not have any problems changing out. 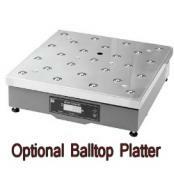 Large 20” x 20” Weigh Platter – Easily accommodates oversize parcels. Power: 120 VAC (+10% -15%), 60 Hz, standard 3-wire ground. Input/Output: RS-232, bidirectional, configurable 1200-19.2K baud. Transmits weight and scale status whenever ASCII “W” <CR> is sent by a remote device. 10' RS-232 Interface Cable (9 Pin to 9 Pin)included with each scale.